I hope 2015 finds you and your family in good health and spirits. At Lida Farm, we’re both tired from 2014 and expectant for the year to come. 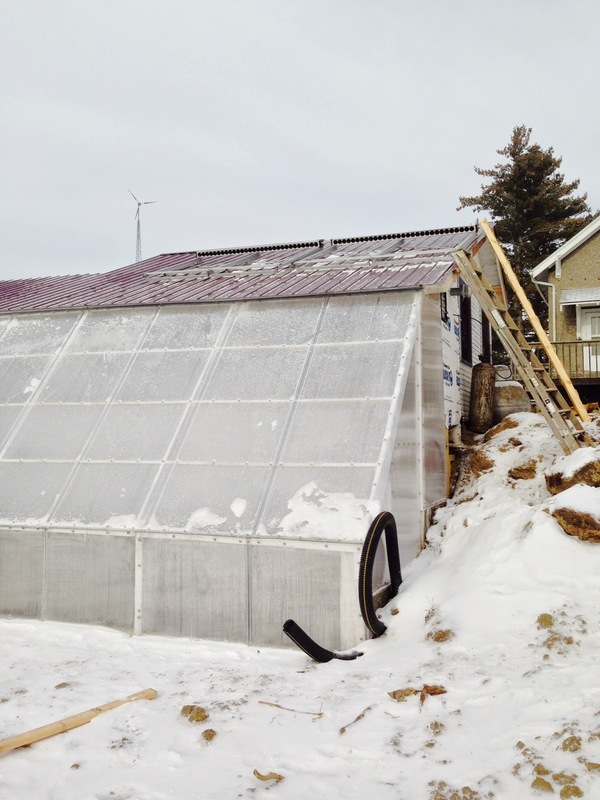 The big chore and accomplishment in 2014 was the construction of our deep winter greenhouse. We are nearly 90% complete as of the New Years. We just attached the two solar thermal panels on January 2, but still need to hook them up. There is also a ceiling I need to install inside the greenhouse to put a barrier between the humid air in the greenhouse and the cold steel roof. Right now terrible weather is holding us back, but we expect to get the solar panels running in the next couple of weeks. We’ll need to do some terracing on this steep hill and bury some tiling, but these tasks obviously wait til spring. 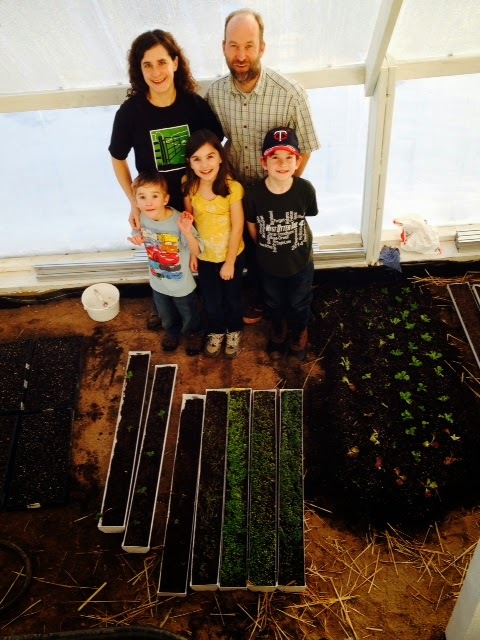 I also planted our first seeds in the greenhouse Christmas morning – unbelievable, Christmas morning! 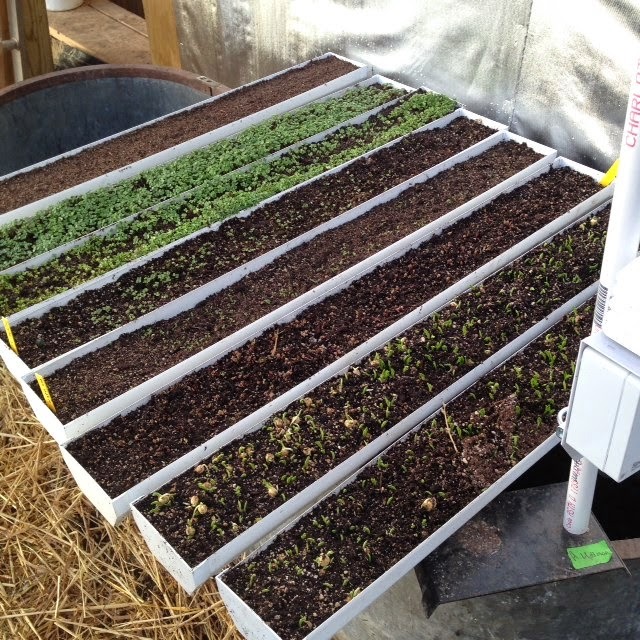 Things are germinating well and the temperature is fluctuating between 32 and 80 degrees, even in the coldest weather. Today we are zero degrees, with an overcast sky and 40 mph wind gusts; the temperature is sitting near 50 degrees and the propane heater is not kicking in at all. We look forward to the first greens harvest toward the end of January and all the off-season growing we can muster between now and May. I am especially excited to grow our own onion starts by seed this year and get those tomato and pepper plants started super early for high tunnel production, not to mention baby arugula in February (I’m getting tired of greens from California going bad in our fridge).